Gunite is a sprayed cement process conveyed pneumatically through a hose at high velocity onto a receiving surface. What this means is that it’s cement sprayed through a hose similar to a fire hose. The cement is a mixture of aggregate (sand, gravel, etc.) and paste (Portland cement). 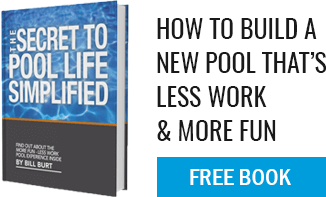 The highest quality pools built are gunite as they are engineered to withstand the movement of the earth due to the strength of the gunite, the strength of the rebar skeleton over which we spray the gunite, and the tensile strength of the structure. Once the gunite is sprayed in place, minimum cure time is seven to ten days during which the homeowner is required to “water down” the structure to aid it in curing properly. After this time, construction procedures, like tile and coping or interior finishes, can be applied.